Sesame Street has solved a lingering public relations problem involving claims by some conservatives that the program was trying to secretly indoctrinate preschoolers with a liberal worldview. The Sesame Workshop's response? It has introduced a new Muppet based on Fox News host Bill O'Reilly. Like his human counterpart, Spill O'Reilly is loud, obnoxious and a natty dresser (though Bill did not think so). But unlike the host of The O'Reilly Factor, Spill, a self-described "dirty socks waving grouch", is aggressively nonpartisan. The host of the No Spew Zone dislikes people of all political persuasions with equal vigor. "We can't stand anybody," he says. This brilliant PR move should put to rest the uproar over the Grouch News Network parody, in which Oscar the Grouch breathlessly reported the ongoing saga of the efforts to extricate Horatio the Elephant from a bathtub. (GNN, like CNN, see? It's not as though Fox News was the only network being gently teased.) While the story played out, Oscar got distracted by vignettes that he thought were grouchy, but wound up becoming horrendously -- for a Grouch anyway -- nice. Grundgetta, Oscar's girlfriend (yes, he has one) called him on-air to complain, and threatened to change the channel to Pox News, a more "trashy" network. Many conservatives were outraged. Evidently, they couldn't hear the "P" in "Pox" -- or in "parody." 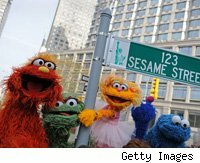 Sesame executives responded that no offense was meant, but they were not believed. Sherrie Westin, an executive vice president at Sesame Workshop, the nonprofit that produces the beloved children's show, appeared on top-rated cable news show The O'Reilly Factor to remind Fox News viewers that to Grouches, "trashy" is a compliment. Remember, one of the show's most iconic songs is Oscar the Grouch's "I Love Trash." The whole Pox News hullabaloo was stupid. Even if Sesame Street was mocking Fox News, who cares? I don't think it particularly bothered O'Reilly, though he jokingly threatened to do an ambush interview of Oscar. The show has had fake newscasts for years, from classics with Kermit the Frog to more recent episodes with Walter Cranky (Cronkite) and Dan Rather Not (Rather). Real-life broadcast journalists including NBC's Brian Willams and ABC's Charlie Gibson have appeared on the program. Williams even hammed it up with the Muppets as they delved into a mystery about why everyone on Sesame Street had stopped sharing. Riveting stuff for preschoolers and their parents. Oscar's serious message to children is that they need to learn how to get along with people who don't agree with them, Westin said. She delivered that statement with surprisingly good humor on The O'Reilly Factor, a program where graciousness often is in short supply.